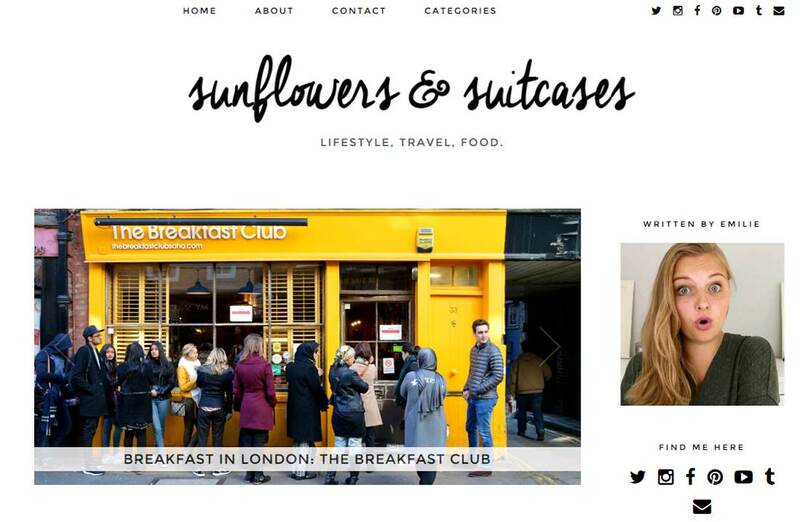 Our 76th “Follow them Friday” features Emilie from Sunflowers & Suitcases who blogs in English. I started blogging in 2014. I used to blog on Tumblr, but decided to launch my own blog on February 1, 2015. So I have been writing for sunflowersandsuitcases.com for about a year and a few months. I wanted two words that could describe the blog and myself. I love traveling, so the “suitcases”-part was decided very quickly. And then I just added my favorite kind of flower, a sunflower. The very first blog post on sunflowersandsuitcases was a DIY Chocolate Milk Jar Valentine’s gift. It’s not on my blog anymore, because I had some trouble with my new theme. But that was my very first blog post. I love my home, so eating in (and especially cooking or baking) is probably my preference. But I also love to eat out with good friends. My go-to place to eat out is probably a gourmet burger restaurant. I love sharing pasta recipes! Pasta is my favorite food, so I do know tons of pasta-recipes. But on my blog, I mostly share baking-recipes. Belgian (no, not French) fries and a burger or donuts! I’m not really a dessert-person. I love making dessert, but I rarely eat it myself! But if I had to choose, I would choose eclairs! Or donuts! My mom and I used to make American Chocolate Chip Muffins together. That’s what got me into food and cooking. The first time I tried to make pancakes, I totally messed up the recipe and ended up having to toss the batter out. Vanilla ice cream, vegetables and leftovers. Studying. I’m a full-time student, studying journalism. So basically writing, but not for my blog. I love PeekInside.nl! She is my favorite food-blogger, hands down!